Every day at our practice, Dr. Cowell uses custom-made crowns and bridges to give our patient’s their complete smile back. Each restoration is specially made for every unique smile, and the end result is usually indistinguishable from nature. 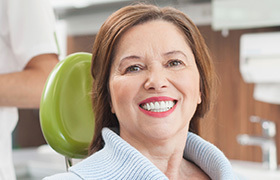 A dental crown is a tooth-shaped restoration that simply fits over the top of a damaged tooth. With it, we can repair a large cavity, fix a broken tooth, hold a weakened tooth together, and even enhance the appearance of a misshapen or undersized tooth. A bridge, on the other hand, is used to replace one or more missing teeth in a row. For this, prosthetic teeth are supported by crowns placed on the teeth on either side of the gap in a patient’s smile. Both of these restorations take about two visits to be designed and placed, and they can even be attached to dental implants to yield even better results. Regardless, if your smile is in need of a little help, Dr. Cowell is ready and able to give it to you, so be sure to contact us today to schedule an appointment.